US-China trade war to highlight the weekend, expect some action at the weekly opening. AUD/USD battle around 0.7300 continues, fresh monthly high skews the risk to the upside. The Australian dollar was among the best performers this week, underpinned by a rally in US equities after dovish words from the Fed's head Powell, with the AUD/USD pair hitting a 2-month high of 0.7343. There was no follow-through, but the pair has held above the 0.7300 level at the end of the week, somehow anticipating further gains ahead, particularly considering the commodity-linked currency survived the collapse of crude oil prices to fresh yearly lows. The absence of macroeconomic figures coming from Australia may have added to the positive tone of the currency. There's a big risk factor in the way. The US-China trade war, with tensions mounting ahead of a key bilateral summit between the leaders of both countries within the G-20 this weekend. Ahead of the event, China has given some signs of ease in its posture, way short of US pretensions. Meanwhile, President Trump said that while China seems now more interest in achieving a deal, he "doesn´t know" if he wants to do it. Whether they will come to a deal of the situation escalate, is something the market will know over the weekend, with the related reaction expected in the weekly opening. The Australian macroeconomic calendar will be quite busy next week, with an RBA meeting included. No changes in monetary policy are expected with attention centered on the statement's wording. The country will also release 3 GDP, foreseen at 0.6% vs. the previous 0.9%. October Retail Sales and Trade Balance figures will also be out next week. Nevertheless, trade-war headlines will likely set the tone. USD strength, on the other hand, will depend on whether the market gets to a consensus over what is the new stance of the Federal Reserve about "neutral" rates. The greenback got sold off after Chief Powell, speaking in New York, said that rates are "just below" neutral, signaling a possible pause in rate hikes, but the FOMC Minutes released one day after, making speculative interest hesitate about whether or not, or when the US will pause its rate hike cycle. Another factor that could affect the pair to a lesser extent is the release of the monthly employment report next Friday. In the meantime, trade war headlines will dominate. The weekly chart shows that the pair has trimmed most of the previous weekly losses, reversing an early slide below a still bearish 20 SMA but developing above this last for most of the last three weeks. The pair remains well below the 100 and 200 SMA, which lack directional strength, while technical indicators extend the battle around their midlines. Overall, the upward potential remains limited in the longer run. In the daily chart, however, things look a bit better. 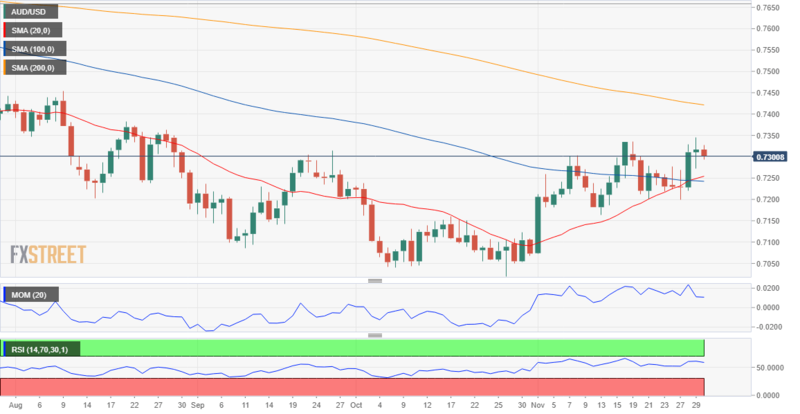 The pair settled above a bullish 20 SMA, which crossed above the 100 SMA both in the 0.7220/40 region, while technical indicators entered bullish ground, the Momentum maintaining its bullish slope but the RSI lacking directional strength at around 58. Beyond 0.7340, the pair would likely extend its gains toward 0.7400, en route to 0.7500, with gains beyond this like still unlikely. Only below 0.7200, the risk will return to the downside. According to the FXStreet Forecast Poll, the pair won't be able to win the battle with 0.7300, as it's seen bearish in all the time-frame under study, with sellers above 50% in all of them, although some optimistic banks seeing in close to 0.780 in the upcoming months. Surprisingly, the number of bears increased, but the average target didn't change much, with the pair seen targeting now 0.7270 from 0.7261 previously. The Overview chart, however, shows that moving averages maintain their bullish slopes, particularly strong in the 1-week and 1-month views. In the 3-month perspective, the rage of possible targets is quite wide, but the largest accumulation comes between 0.7000 and 0.7200.